Snowshoes have been in use for 1000's of years to successfully move people over the snow. 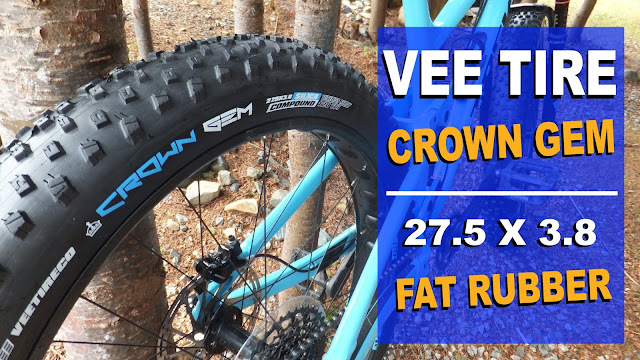 The folks over at Vee Tire have harnessed the intent of the snowshoe and wrapped it around a rim for us fat loving folk. 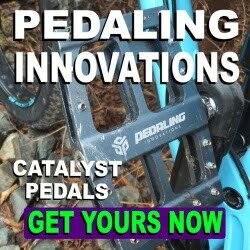 The design direction was influenced by our super successful Trail Tracker MTB tire and built for the meatier Fatbike sizing. 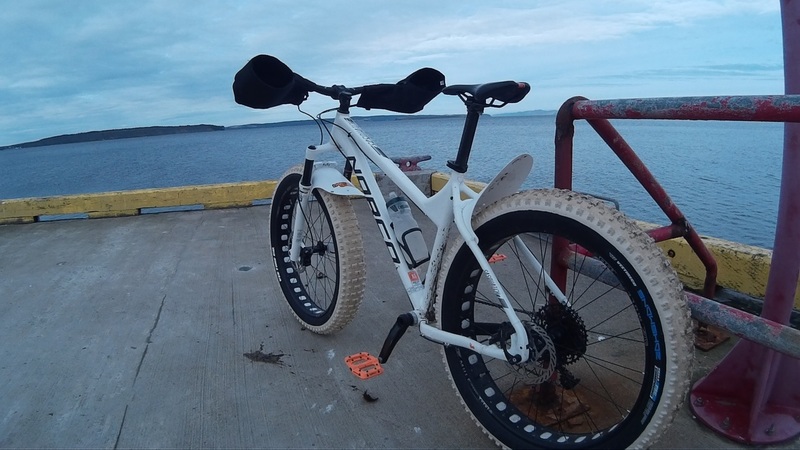 Although called the Snowshoe, and manufactured with silica, this tire is equally impressive in cold and warm weather and anything in between. Open and aggressive tread pattern designed to get you through snow, mud and anything else you can throw at it. 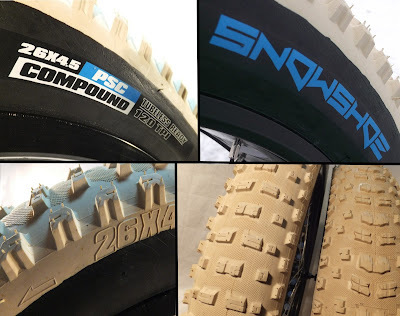 The Snowshoe is now offered in two flavours, a Silica Compound [black] and a Pure Silica Compound (PSC) [white]. 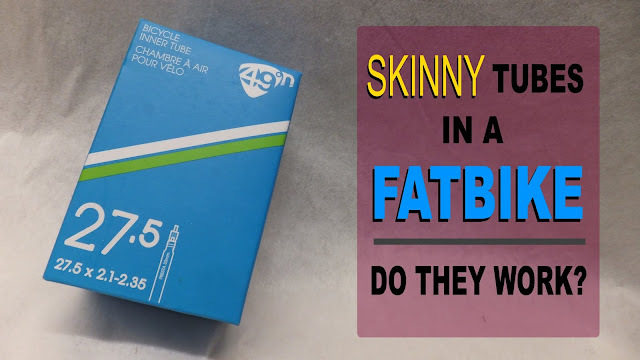 Both tires have a 120 TPI, a claimed width of 4.5 inches and weight of 1330g, are tubeless ready, have a folding bead and are directional. Be sure to check out the video below for some up close and personal shots and actual field test footage. The Snowshoe PSC is not actually true white, its more off-white and this treatment is exclusive to the PSC compound. 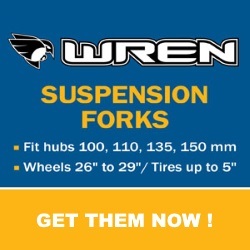 This compound allows the tire to perform better on ice, makes it quieter and allows less debris to stick to the tire. Its the softest of all the Vee Tire rubber compounds which is also shared with the XL and Bulldozer. The tread pattern consists of alternating single and double, slightly ramped, rectangular center lugs. These are flanked by alternating small and large square transitional lugs. While the evenly spaced rectangular shoulder lugs complete the pattern. The significant difference in this year's Snowshoe is the addition of "texturing" on the carcass of the tire. 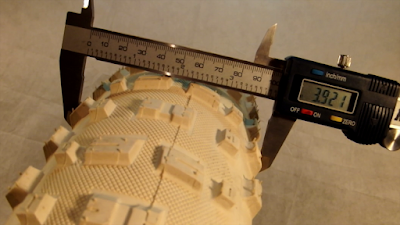 Vee Tire claims that the tires are 4.5" wide, however when measured with 8psi on 80mm rims they are closer to 4". That's about 1/2" smaller than advertised. 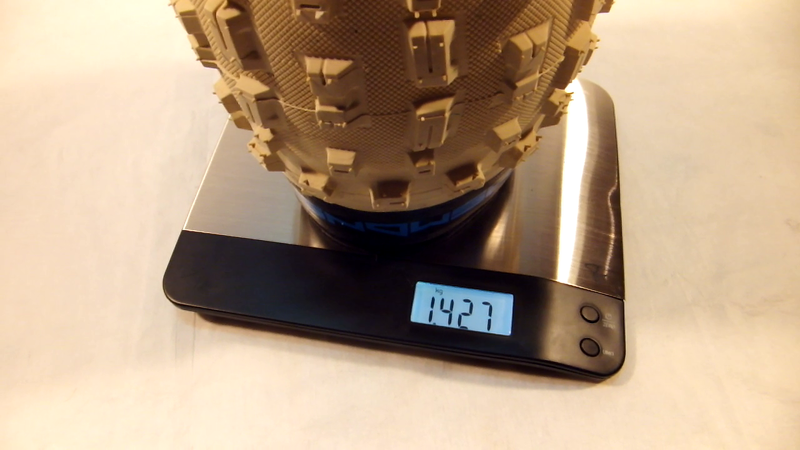 And the tires are a little heavier at 1427g per tire, which is 97g heavier than the claimed 1330g. There was a significant amount of snow available to give the Snowshoe PSC a good run in the white stuff. 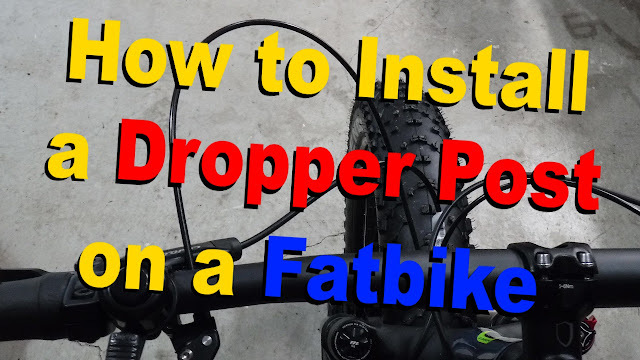 I initially ran the rear tire in the recommended rotation, however I noticed that the traction was a little . . . lacking. So I reversed it and boy did the tire shine. After I posted the Sneak Peek of the the tire I had someone contact me to ask about snow buildup in the tread. 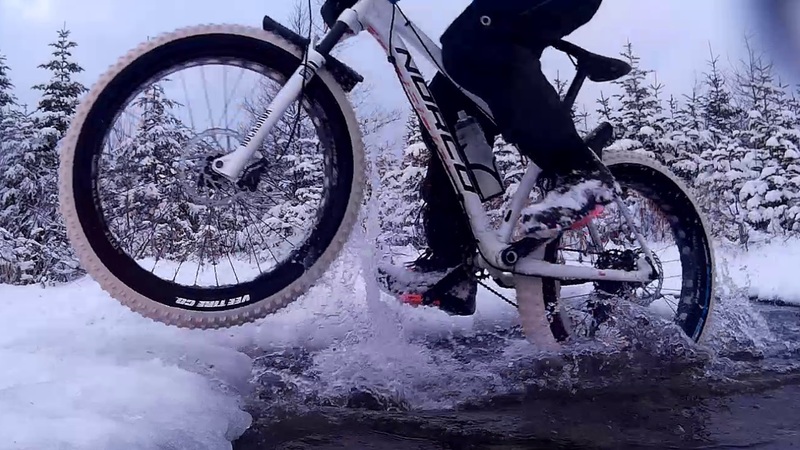 I can say that this tire had no more buildup of snow than any other tire I have tried or ridden with. Actually, after getting the tire wet during a water crossing I expected to see the tires turn into a rolling white donuts, but it didn't happen. I tested these tires for several weeks in different snowy conditions, at different temperatures and in different weather conditions. I pretty much set them to my preferred pressure (4-5ish) and rode them. 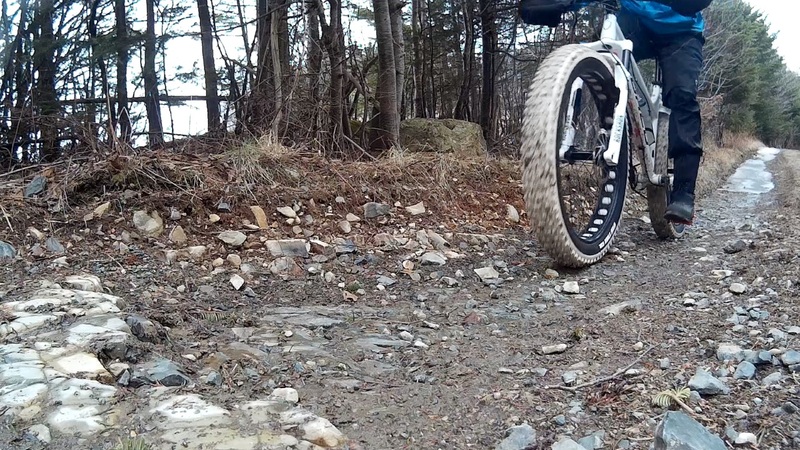 These tires impressed me. There was ample traction, great float and very little washout. I did encounter some ice, and although nowhere as grippy as a studded tire, I did feel a little more confident. 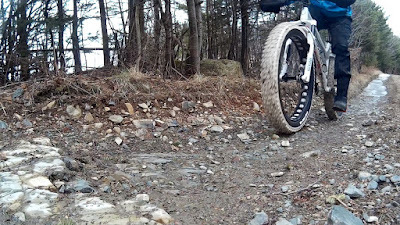 An unseasonably warm spell did allow me to try them on a groomed gravel trail. Airing them up to 12psi they rolled quite well, although I was still running the rear backwards at the time. Putting the tire on in the "correct" orientation would have allowed the tire to roll more quickly on the ramped center lugs. Hitting some wet dirt roads, with a little less air pressure, the Snowshoes felt right at home with no complaints. 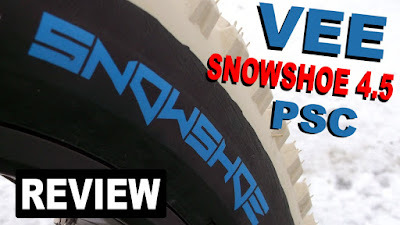 Its crystal clear that the 2016 Vee Snowshoe 4.5 PSC is a good performer in the snow with the PSC compound making them feel a little grippier on ice. Based on some dirt exposure, and the overall open tread pattern, I'm pretty confident it should also be a good performer during the non-snowy season as well. Although they may not roll as fast as their Bulldozer cousin. 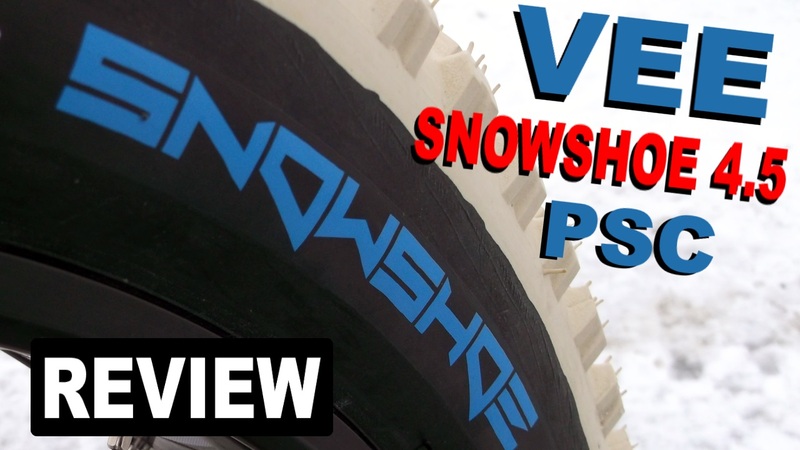 The Vee Snowshoe 4.5 PSC . 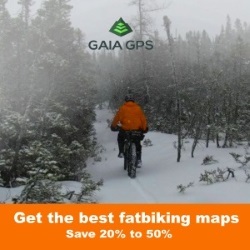 . . a very good 4" all-season rubber option for your fatbike. You will not be disappointed in this tire.